Sharing today, how to Up Your Summer Style Quotient when Pregnant & Showing ! I initially wrote this piece for Babychakra. Babychakra is an online platform for moms, that helps them connect with like-minded moms and sail through the journey of motherhood with a lot more ease! If you are not on their app, you are missing a lot of fun!! When you are pregnant, a lot of clothes stop fitting, nd even when they do, they aren’t comfortable. Staying at home is fairly easy, for you can just slip into a cotton maxi or a 500XL tee and a pair of shorts (Or maybe just the tee). The real problem is when you have friends to meet or parties to attend. 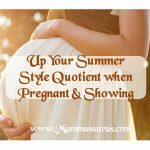 To read the original article on “Summer Style Guide For When You Are Pregnant And Showing!“ click here. But worry not, for I have your back. From the choice of colors, to fabrics and cuts, I talk about it all! Do let me know how you liked the article. If you have a tip or two to share, please do! Don’t forget to share this blog with your friends, especially women who are pregnant! hahah.. i loved staying at home too. I was more of a desi maxi girl. But when i went out, i made sure i made up to it. How i wish i got this guide a few days before when i was pregnant. I was more of a maxi fan those days. I had my maxi days too!! that is a ‘fashion statement’ in itself, no??! !